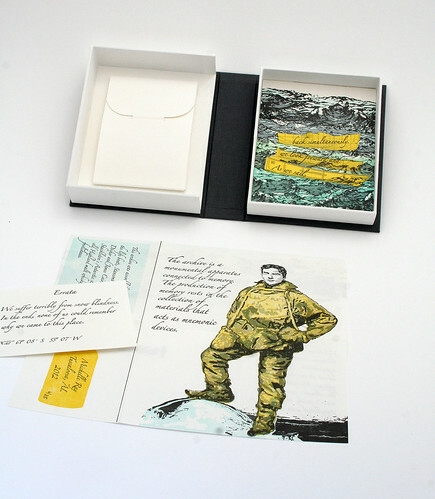 The two books That’s What You Write About – Give & Take And IN THE FACE OF IT from C&C Press live in custom boxes; boxes that are more enticing than most both because of their lively colors, and that their design and construction includes accent colors along the joint. I like things that are square so I’m first drawn to the blue and red box with Morton Marcus stamped on the spine. I open the box to find not a square box, but one that is round. 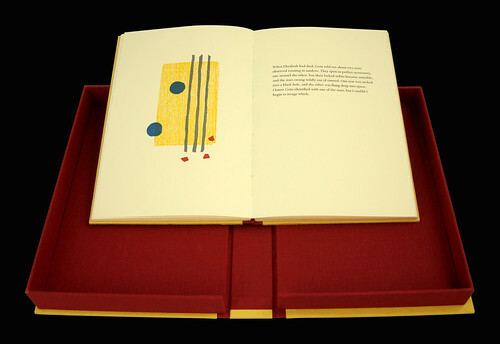 To meet the challenge of binding a shape that has no vertical fold the book is stab bound in a double x pattern that only goes front to back, not around the spine edge. An inevitability with stab bindings is that they don’t open as well as I think books should. This one, however, has a nice deep spine piece that allows it to be gripped in one hand, while the other hand turns the pages, applying light pressure as needed to hold a page spread open. When I hold a book like this, I want to stand up; and when I stand up with a book of written words I feel like I should be reading aloud. 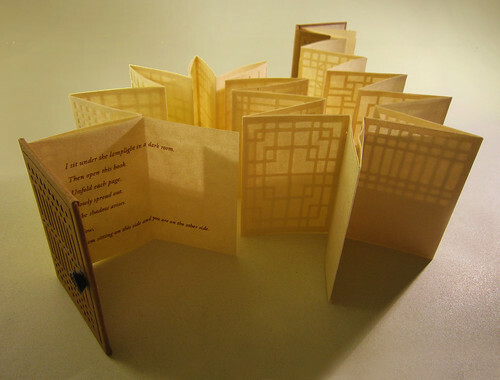 Perfect – poems enjoy living in sound waves in addition to living on printed pages. The book presents two pieces by poet Morton Marcus, presented one alongside the other rather than one following the other. 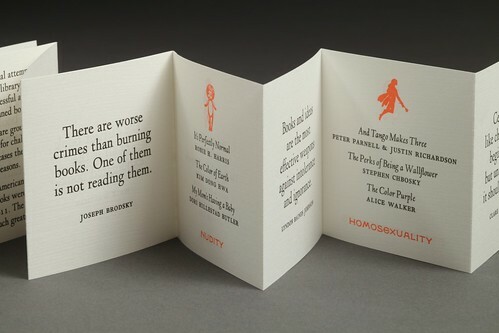 That’s What Your Write About is printed on the left of each spread, on letterpress printed blue lined paper, in a rendition of the poet’s own hand. The hand that gets to turn the pages (in my case my right hand) is thrilled to feel the impressed blue lines, while my eyes appreciate the red vertical line that simulates that blue-lined paper that was endemic in my youth, the linespace decreasing as my handwriting grew more skillful and sophisticated. Looking at this book my mind wanders, trying to remember the last time I felt the thrill of excitement that looking at a stack of blue-lined paper used to bring. That this paper is now something I feel nostalgic about isn’t something I’d have ever predicted. Back to the book: the right page of each spread presents Give & Take in a large typeface that once again has me waxing nostalgic as it looks like (and lo and behold, on reading the colophon I learn that it is indeed) the type face used for ‘old timey’ playbills. From the colophon I learn that Give and Take was printed using Playbill wood type, found in the basement of a Seattle boxing ring. “That’s What You Write About – Give & Take” features two poems by renowned poet and author, Morton Marcus. While preserving the integrity of the author’s original text, the decision to marry these two poems and their respective titles creates a third poem in which urban and rural themes interact. This third poem focuses on the environmental impact of urban life. 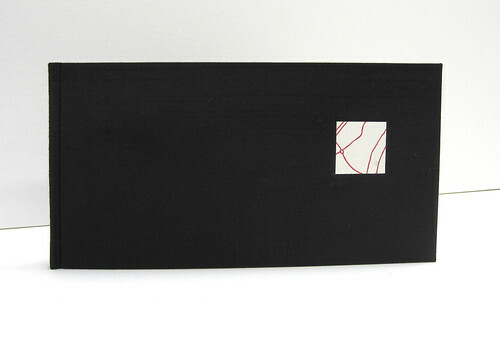 Although IN THE FACE OF IT from top view looks like a case bound book the spine is exposed, with the title printed vertically along the outer folds before the pages are folded and bound, making the title visible on the spreads between sections. 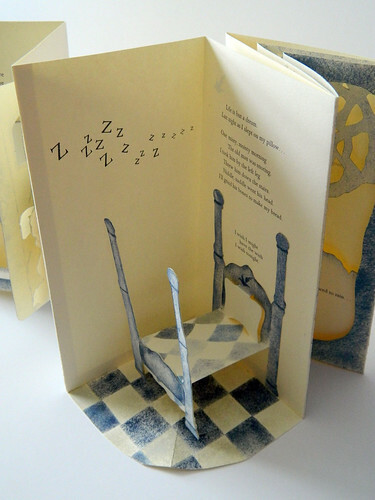 Without a spine to interfere the book lies flat, inviting lengthy perusal of spreads that include multi-color printed woodblock images and text. 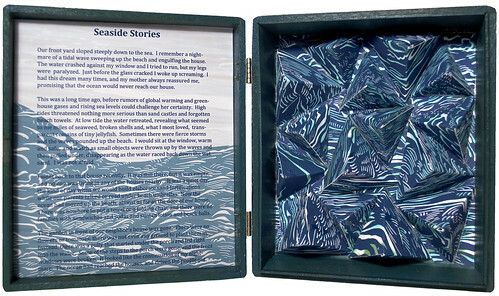 Both the writings and original woodcuts are by poet and book artist Gary Young creating a serenity and flow throughout the book. 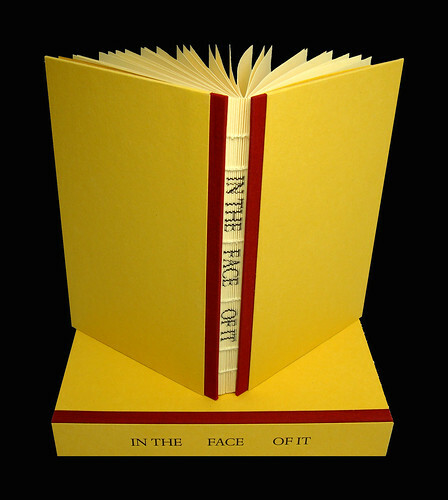 IN THE FACE OF IT contains original poems and woodcuts by poet and book artist Gary Young of Greenhouse Review Press. The book is dedicated to Elizabeth Sanchez, Young’s close friend and mentor. His series of poems are a response to her death. 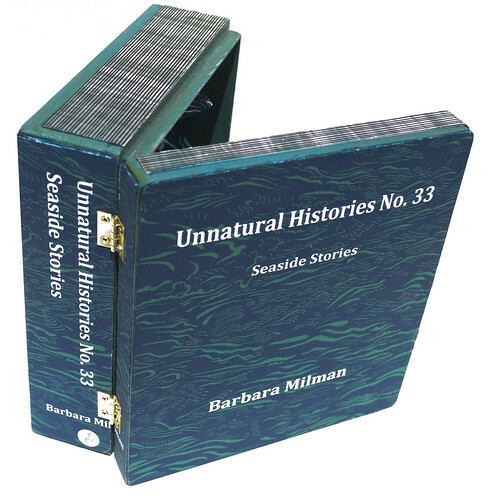 The exposed spine sewing was chosen to the reveal the printed title. The registration of the print on the folds of the pages gradually ascends. 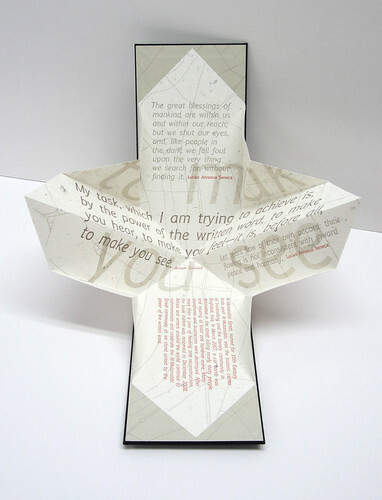 The effect is that the reading experience visually reflects the temporal nature of the poet’s grieving process. Click here to see the online catalog page for these books. 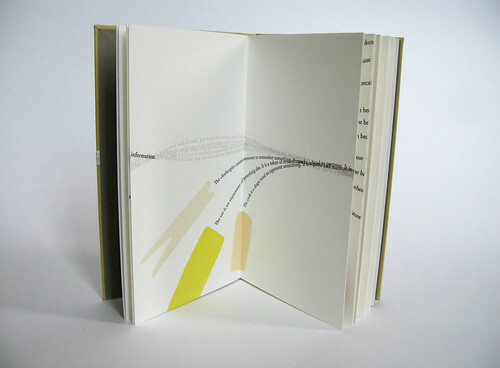 The recipient of this year’s Juror Choice Purchase Award is Sarah Bryant’s book, Fond. Fond is available, along with Sarah’s other work, for purchase here. 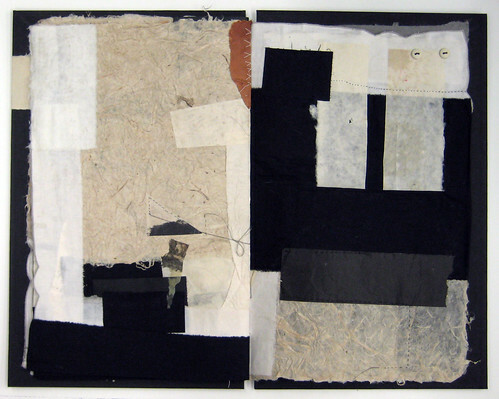 is an investigation of our impulse to collect and preserve small, valueless objects. These objects help us create create a simple, personal narrative. A “fond” is a collection of documents organically accumulated by a person or institution. Using halftone photographs, color silhouettes, and a winding sinew of text, I constructed an abstracted and personal history of ten objects from my own collection. 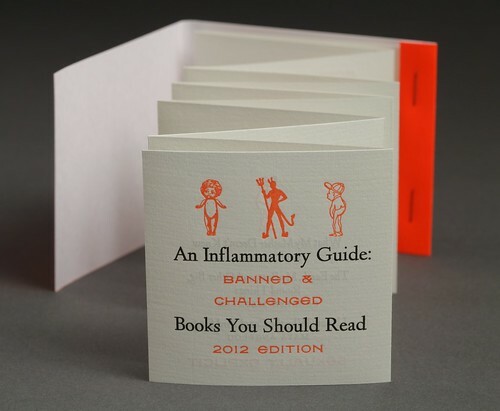 The slim volume is housed in a duo-tone chemise of cloth the color of marigolds with grayish brown Zerkall paper strips overlaid at the head and tail. A label is on the lower right of the chemise’s front, arcing up at an angle from left to right. Intriguingly this label does not mention the title of the work, that tidbit is reserved for the book’s interior title page. Instead, the chemise label has this phrase “constitutes a piece of evidence about the past.” The book also lacks a spine label. The book’s front cover has another paper inset label with overlaying sentences printed in a light tone forming the background for the darker printed phrase “an account of an act or occurrence”. This label is in an organic shape (think lanceolate leaf shape) that repeats throughout the text block. 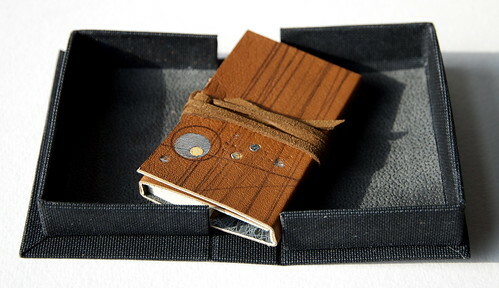 The book is covered with tan book cloth, bound in a flat back drum leaf binding. 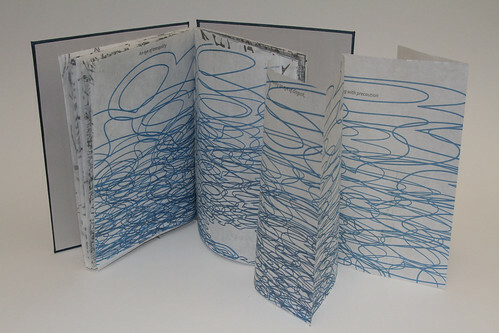 As is consistently the case with Sarah’s work the book is impeccably designed, printed and bound. Fond, at about 7×4 inches closed, is a wonderful size to hold in two hands. It functions well, a fact that is much appreciated in this case because text and image go across the gutters on each spread. 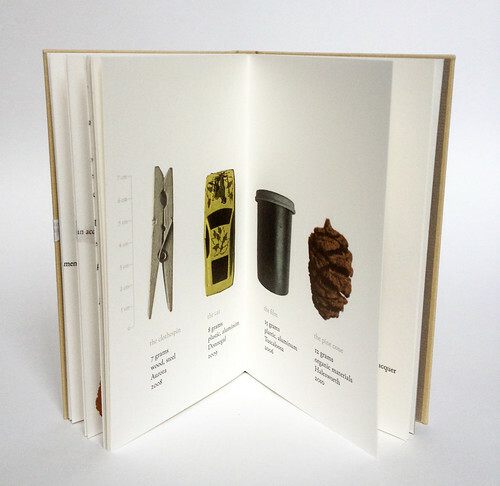 The first several pages introduce the ten objects with narrative; the appendix or book legend (nearly as many pages as the narrative section) includes, along with an image of the object, its descriptive name, weight, material, place and year of acquisition. A helpful centimeter rule is also provided, printed along the left side of the appendix’s first spread. That sentence continues on to the next page, alongside graphic and textual introductions to four more of the ‘fond’ objects. For each object the description is started on one spread and moves through the book, along with the continuation of the description of the other introduced objects. 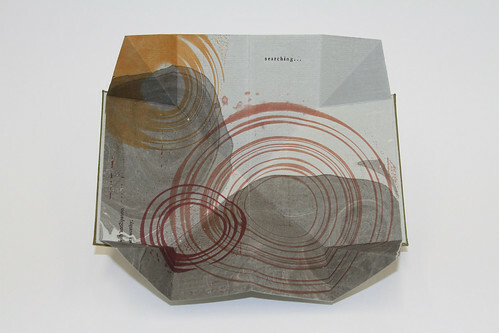 Turning the page gives introduction to three more objects, the next page the final two. 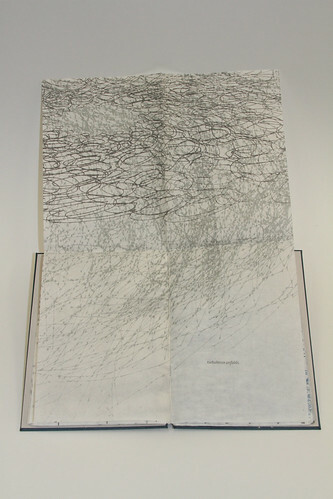 The text visually weaves and overlaps just as these objects have layered and woven through Sarah’s recent years, The final page spread of this section has all the sentences converging into one dark block of inkiness. Turn the page and, a whisper of the book’s governing motivation “I recollect”. Savoring this book involves moving back and forth from page to page, perhaps to pick up an earlier thread of a particular object’s tale and following it through; then paging back to begin the narrative about another object. 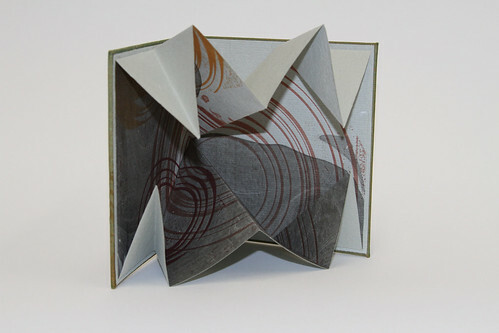 The drum leaf binding, with its slightly stiffer pages, facilitates this forward/backward movement. The wonder is that, although there are so many stories overlapping, the book pages are spare and clean. 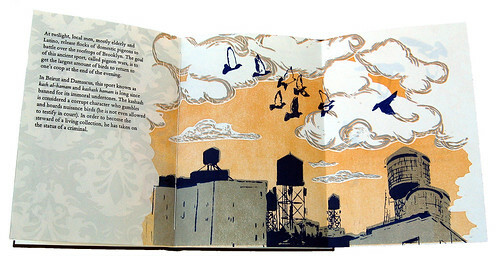 Fond is available, along with Sarah’s other work, for purchase here.